I label all my Christmas gifts with a SHARPIE. I know, it’s horrible. Most people use ribbon and bows and beautiful gift tags. I use a sharpie. My parents have done it since I was little, and it just rubbed off on me. I can’t imagine labeling gifts any other way. Yesterday I threw away all the Christmas candy and the homemade gingerbread houses that the kids made. I didn’t want the candy temptation around me anymore because I’ve put on a few pounds (8 actually) this season and my clothes are.not.fitting. at the moment. I forgot to water the tree. And now it’s so dead and dry that I’m afraid it’s going to catch on fire. I arranged all the gifts for this picture. They were stacked and scattered all over the place. The kids like to pretend the gifts are building blocks. And I let them. Wanna know why the tree looks so sparse all of a sudden? When ornaments fall off the tree, or the kids and dog knock them off, I don’t re-hang them. I toss them in a bin and they won’t come back out of said bin until December 2011. Kinsey (my 6 year old) got into a heated argument with my husband. She INSISTED that Jesus was born in Hobby Town. 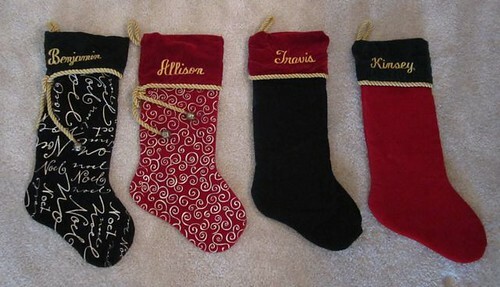 I promised you guys in THIS POST that I’d show you the fancy stockings I made in 2000. I never did. Here they are. I never hung them. Maybe next year. Every year right before Christmas I get so sick of all the extra decor around my house that I have to fight the urge to pack it all away until after Christmas day. He was only partly kidding. The tree is usually at the curb for recycling by the afternoon on the 26th and the decor is usually packed away that morning. I baked. And didn’t take pictures. And am not going to blog about it. 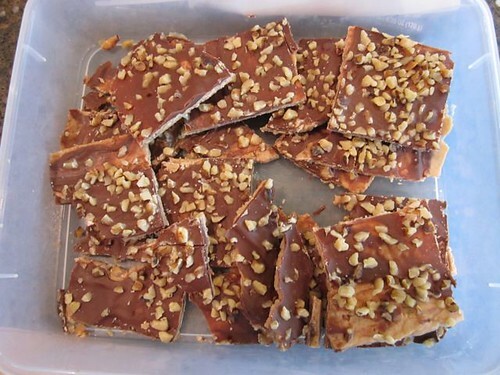 But I pulled this toffee out of the fridge and took a photo for you. And here’s the delicious recipe but I’m not doing a separate blog post about it. *Must use a metal saucepan that does not contain any non-stick material. Melt butter in saucepan. Add sugar and water. Once boiling add almonds. Boil until it reaches 302 degrees or hard ball/crack stage. Stir constantly. Pour in a greased cookie sheet and spread out evenly. Put Hershey squares on top. Spread chocolate once melted. 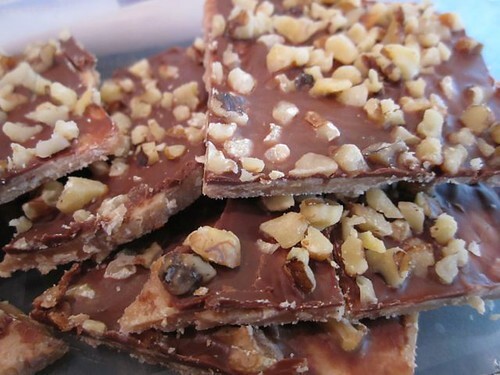 Top with pecans or walnuts. Place in fridge until hard. Break into pieces and store in air tight container in fridge. *Recipe courtesy of HouseofHepworths.com. I let my kids decorate pretty much any way they’d like. 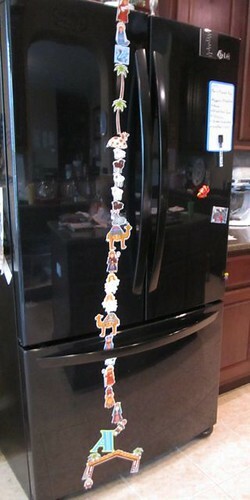 Including stacking all the nativity magnets one on top of the other on the fridge. I have like 20 billion pictures and posts saved up that are un-Christmas related that I can’t wait to post for you guys. But I need to get all these Christmas posts up before the 25th. Who wants to read about all this Christmas stuff mid-January? I didn’t think so. Me neither. Those are my Christmas Confessions. Just grab a sharpie and write Scrooge on me. Or Grinch. Either will work. I do love the holidays. I just wanted to get those things off my chest. Do YOU have any confessions? 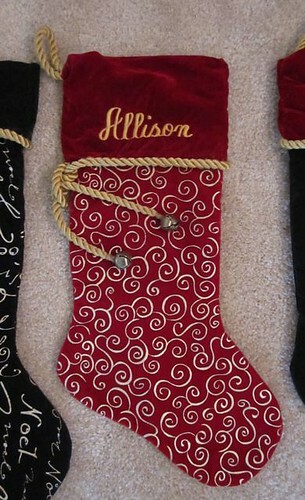 My biggest Christmas confession was that I usually use gallon size ziplock bags for Christmas stockings. 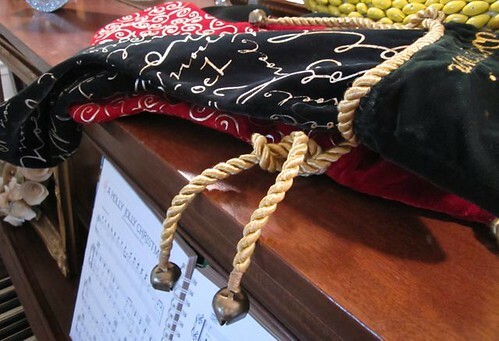 I never seem to get my stockings made or hung up. And another confession. I didn’t take down my Christmas decor until the end of January last year. Only because I was too lazy to do it sooner. I’m shooting for New Years weekend this year. But we will see. As much as I love wrapping Christmas gifts, and I do, I like to think of them as mini craft projects, this year my back was killing me after a mulitday wrap a thon. I’m seriously considering making fabric gift bags for the gifts for the extended family to make my job a lot easier because I’m kinda cheap (Uh, I mean GREEN) and wouldn’t get paper ones back to reuse the next year. 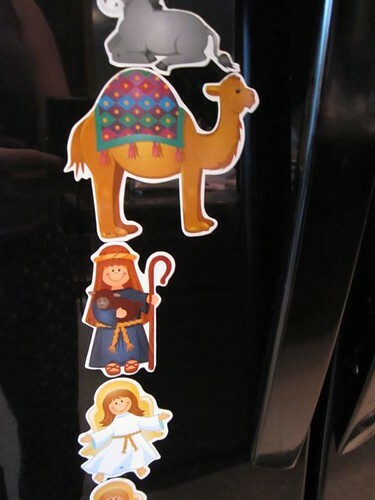 I like the nativity magnets. It looks just like the Living Nativity in the Christmas Rockettes show. Another confession: I can really only stomach watching stuff like the Nutcracker, the Christmas Rockettes, A Christmas Carol, etc. ONCE not year after year after year. The only exception is A Christmas Story because it’s a slice of life movie w/ no Smash You Over The Head With a Message Movie/Show. I totally write on my Christmas presents with Sharpie too! 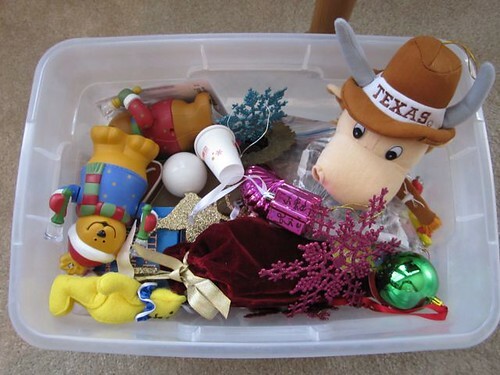 Why not just throw that longhorn ornament in the trash? I mean they didn’t even go to a bowl! That is hysterical, Allison!! I especially love the Nativity magnets! 🙂 My confession: We put up our tree this year, and added lights, but we never got around to adding any ornaments. Se we have a nice lighted tree, but no decorations. 🙁 Pathetic, I know! Merry Christmas! Tell Travis & Kinsey that I send them a big hug! Hey, at least you use a sharpie. My mom would write in pencil on the tape on the back. More than once as we were opening the gifts- the wrong one of us had opened it! Thanks for sharing all your confessions. I had about 8 of the same. I have these grand visions of what our house will look like for Christmas and never end up doing half of them. Nice to know you are human. =D Merry Christmas and have fun undecorating your house. like, the sharpies! man! prior to kids i used to go all out on the wrapping. now, i slap a little paper on there and sharpie marker and call it a day! our tree is almost dead too. i can’t water anything alive to save my life. plants outside are either fake or on a timer and the landscaper takes care of it. maybe i will water it today after i am done typing, but probably not. i bought myself a silhouette machine for christmas as a, ‘i work so hard as a mom/teacher/photographer i deserve it’ present. when it arrived, my husband was so upset. he bought me one too after he read my post about how i wanted to win one so bad! so, it has to sit under the tree, maybe until valentines, as my punishment for ruining his christmas! i didn’t even know he read my blog half the time! i feel like an idiot. i did almost all of my christmas shopping yesterday. what i didn’t get yesterday i had done online prior. i know hate shopping. wow….this feels good! i could probs go on and on, but think i will stop! OK, you crack me up. I laughed out loud when I read that Jesus was born in Hobby Town. Awesome. Cheers – and Merry Christmas to you! 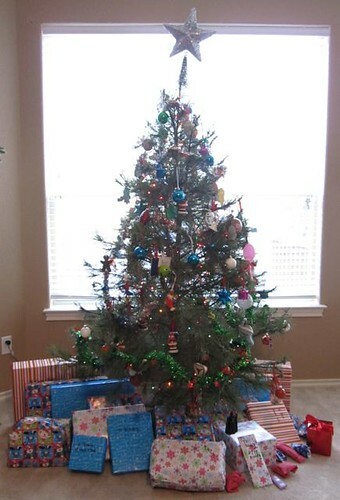 I’m so glad you posted this, I didn’t put a tree up this year…I confess. We are recent empty-nesters(it might stick this time). The grandkids come over a lot and my Grand-daughter is a 7 month-old. She is already climbing and scooting and the tree seemed like a major hazard. I like the sharpie idea- I have a metallic silver one that might work….I haven’t started to make tags. I did manage to whip up about 7 t-shirts for presents, Thanks to the Silhouette, I killed my beautiful poinsettia, not sure what I did. This post is hilarious!!! I love the honesty! My family also uses sharpies to mark packages! I’ve only addressed 2 at all this year, and it’s really small on the backs with ink pen so I wouldn’t get them mixed up. I have also baked without blogging about it. I never finished decorating either!! I just shoved the boxes into the garage until we get back from our vacation so I didn’t have to look at them anymore. AND just like you, I am SO over the ‘clutter’ by the time Christmas is over, I can’t wait to get my house back in place. I’m not sure why but that magnetic garland of nativity stuff has me giggling like crazy. I LOVE LOVE LOVE Christmas decorations…I’m just too lazy to put up a lot of them. Also, my 2 year old would pretty much wreck them, so most of them stay in a bin in the garage. Our “tree” is really more like the size of a tree branch, no joke. I bought it 5 or 6 years ago at Target for $10, and it’s been our only tree since. I always bake or do crafts and forget about taking pictures, then I wonder why I have nothing to blog about. Loved your Christmas confession. I’ve gone the sharpie route myself this year. And I’m so glad to hear that I’m not they only one who lets their kids have free reign with the decor. Oh, I LOVE IT!! 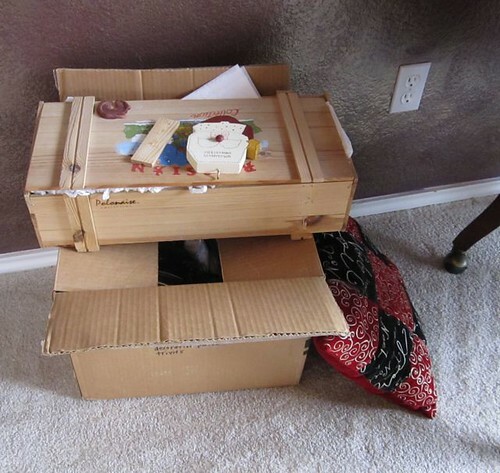 I share some of your confessions – I let my kids decorate any way they want. I HATE wrapping gifts so most of them are in bags. If they MUST be wrapped with paper, they’re luck to get a tag, let alone a bow. My newest confession this year? I let my 6-year old do some of my wrapping. All by himself. And I love it. I use sharpies on Christmas gifts too:) I am not known for my Christmas present wrapping abilities. I just don’t have the patients and they rip it off anyways. Also, I have been fighting the urge to take down the decorations this year too. They kind of bug me because it feels like clutter. I can’t wait for this holiday season to be OVER. This is my fourth year to be completely alone for the holidays and all the other days of the year too. Being a compassionate human being, I will always be encouraged by the love others have for their friends and family and the blessings of their lives, even for their triumphs and failures and whatever helped pull them through — always. But honestly? Hearing about it so much at this time of year is almost unbearable for me. Trying to feel some sense of connection with the spirit of the holiday, I did some decorating this year out of seasonal boxes that had been packed aways for 12 years, but instead of lightening my heart as I’d hoped, looking around the place makes me feel like the Eleanor Rigby of Christmas, me with my face that I keep in a jar by the door, decorating for a party that no one will attend. And I’m awful — just AWFUL — for writing this on your blog, and still I do it. Please forgive me. I’m just so bloody sick and poor and alone. 1. I never finished decorating either. 2. I made my daughter wrap all the gifts, except her own. And they still aren’t wrapped yet. 4. I haven’t watered our tree in days. Hope the kids remembered. 5. I have half finished glitter Christmas trees on my dining table… and guests are arriving today. 6. Think I’m going to label all my presents next year with a Sharpie. So.much.easier! 1. I used the same giant roll of paper for every single present. 2. I have a freezer full of cookie swap cookies for neighbors and friends and will not get around to giving them out. 3. I did not finish one sleeve on a sweater I knitted for my daughters soon to be new american girl doll. 4. We all got bored with the advent countdown awhile ago and stopped doing it. 1. I wrapped every single present! 2. I made 15 dozen cookies for a cookie swap, all my friends got to enjoy my 15 dozen cookies and I now have a variety in my freezer to keep my vegetables company. 3. I almost knitted an entire sweater for a doll! shewwww! What a relief. I promised myself I was going to simplify this year, but as I stood in Walmart last night at 10:30 lamenting over the lack of choice of labels that would truly match my wrapping decor and secretly feeling guilty becuase I didn’t design or at least print off my own labels, I realized I’d forgotten that I was going to simplify. Well, your blog is such a relief, reminding me that “perfect” is for perfect people and I don’t know any! Merry Christmas and thanks for making me laugh, literally out loud, today! I usually use a sharpie too! I think it’s pointless to wrap everything up all pretty if kids are just going to be tearing it apart. Maybe that’s why I will never become a cake decorator. And I also have a box of Christmas decor that hasn’t gone up yet. Oops. Bless you for this. I love this post intensely. Love the confessions. You at least decorated more than we did. I actually used the tree in the lobby of my building to photograph ornaments this year (of COURSE, you won’t get strange looks when you move ornaments around on a public tree, add your own, and start snapping pictures… people do that all the time, right?). For my “holiday home tour” post, I posted pictures of our repo house reno — complete with plastic Santa in the crawl space…. I love it!!! I use the sharpie too. Thank you for keeping it real!! and you shouldn’t feel obligated to post a separate post for the recipe. I’ll always remember this post now! Too funny 🙂 I too am itching to get the Christmas stuff packed up asap. Merry Christmas! Christmas confession: I made beautiful Christmas cards and never got around to sending even one of them. I’ve even lost a few. ARGH! Love this! The REAL story of what goes on in every household. Blessing for a fabulous Christmas, dead tree and all! Confession #1 is my fav. Love the Sharpie! I am totally doing that next year!!!! Thank you for the laugh. This post made my night! Thanks for a good mid-afternoon laugh!!! 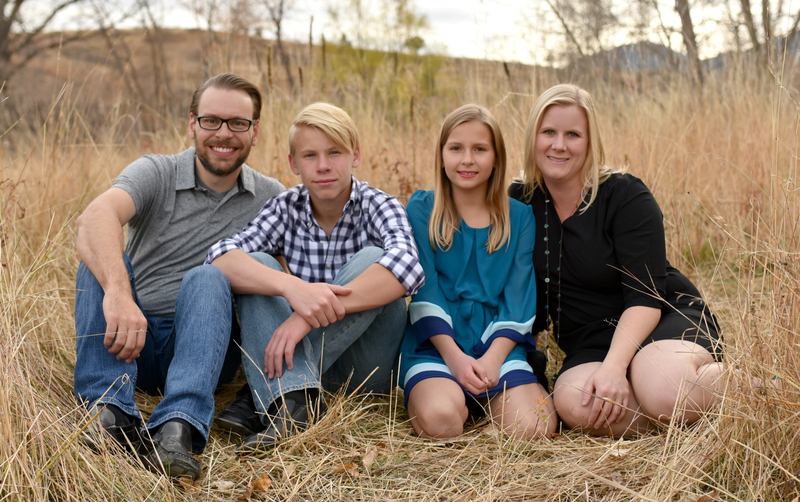 Love your honesty…no sugar-coating on your blog! Love it!!! Hilarious post! Love the honesty 🙂 My Mom always labled our presents using scraps of wrapping paper and folding them like little cards. ha. I have a cousin in Austin so I’m hoping to get out their sometime next year 🙂 Would love to meet you as well. BEST Christmas post of all times! I NEVER get to everything I want ot at Christmas–and I love that you blogged about this! Makes me feel like I’m not the only one, lol! I see we shop at the same place, Costco. I have all my gifts for my family wrapped in those papers. They are so cool because they are reversible. 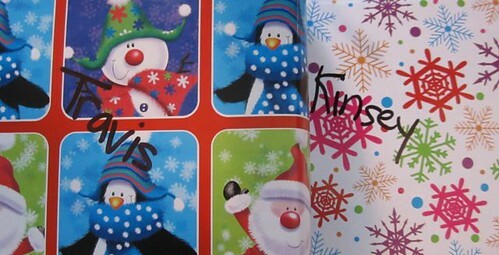 I don’t even write their names on them, I just wrap each family member in one of the style of wrapping paper, so I don’t need to put their names on them. Tara got the blue, Tiffany got the snowflakes and Shannon got the stripes. Easy peasy. Absolutely HIL-A-rious. Oh my gosh. You made my day! Thank you friend. Things are not as perfect as they seem. You crack me up! You need to relax with a blanket and an old Christmas movie or any movie you haven’t seen for a while. Have a Merry Christmas! i use a black sharpie to label Christmas gifts too! always have & probably always will 🙂 ha! glad to see i’m not the only crazy sharpie loving person out there!! Ok since you laid it all out, i’ll spill. Write a name i use numbers! Room bathrooms included. How many did I put out this year, zip-ziltch-nadda. We do have the one live tree in the foyer which is 13′ tall. It will have to do. My decorations this year consist of anything red in my house put out. I bought a bunch of white candles to “pimp” my red and 2 boxes of candy canes for the kitchen island. Outside, greens on the wood boxes, a candle and some pineapples to make it look somewhat decorated. Oh and spices, orange slices and water in the simmering pot to make it ” seem” like I bake! Thats it. I greet people at the door with a smile and tell them i’m doing the “less is more theme” this year. I dare anyone to dis me! 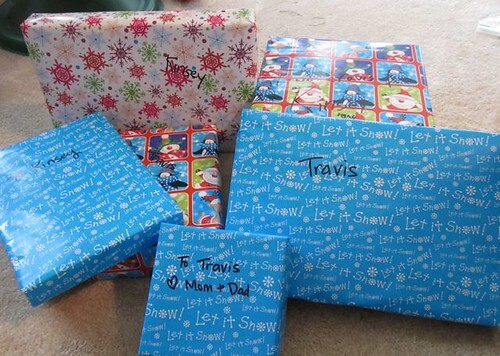 I use a Sharpie to label “Santa” gifts. I use gift tags for my gifts though. This year, I didn’t put as many decorations as I normally do so my house isn’t so jam packed with Christmas. So it’s not bugging me too much. I will leave it all up until New Year’s Day. Long live the Sharpies! Hey they can be festive in red or green 😉 We do it too!! Ummm…I use sharpies too. I gave up the bows and gift tags years ago. Nobody notices…they’re too busy ripping the paper off. I can echo almost all of your confessions. I love your blog, and your confessions. My confessions, I didn’t decorate at all this year except for 2 wreaths, one inside and one outside. I just didn’t feel like dragging the boxes from the basement, putting them back down, then bringing them back and forth to take everything down. I haven’t baked a single cookie this year, I’m planning on making some brownies for Hot fudge brownie sundaes for Christmas dessert. Question – Does Santa also just use a sharpie? My mom prints out labels on the computer that just say our names… love it! Too funny. You are not that far from the truthful lives of so many of us. Tree removal (check); ornament falls (check); half done decorating (check); package writing (check) they make those darn tags so small; tree watering (check) bought a fake one; stockings (check) never finished embroidering the names on the kids. Sometimes I take down the Christmas decor BEFORE Christmas. We don’t have any kids, and then we are gone for like 5 days driving across Texas. It gives me anxiety to come home to all that extra decor and all the new gifts. OMG i am laughing so hard this is so FUNNY! I also use a sharpie i dont see a point in wasting the name tags when honestly i use certain paper for certain people but i do write it on the back of them!